Advance America is the state's largest pro-family and pro-church organization. Advance America was founded in 1980 by attorney Eric Miller with just 10 people. Today, the grassroots network includes several thousand families, hundreds of businesses, and hundreds of churches around the state. Advance America is a non-partisan, tax-exempt educational organization and as such does not endorse any candidate or political party. Advance America's staff review every bill filed in the Indiana General Assembly (more than 1,500 in some years). They evaluate each bill, offer testimony before legislative committees, talk directly with legislators, draft amendments and bills, sound the alarm when individuals need to call their legislators, and train people how to lobby. 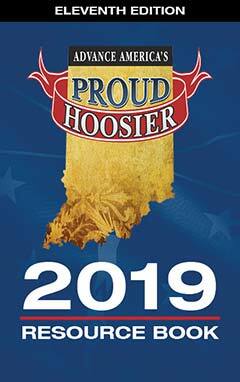 Proud Hoosier Partners also receive the brand new, "Proud Hoosier 2019 Resource Book" as our gift for joining. This "how to" book written by Eric I. Miller explains how your Indiana Legislature operates and how you can impact what happens at the State House.